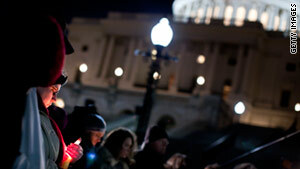 People gather at the Capitol for a vigil on Saturday. Capitol Police tell House staff to "take reasonable and prudent precautions"
(CNN) -- Lawmakers are weighing the benefit of accessibility with the necessity of security in the aftermath of a shooting at a political meet-and-greet outside an Arizona supermarket. The lack of security is nothing out of the norm. Members of the House and Senate leadership have security provided by Capitol Hill, but rank-and-file lawmakers don't receive a constant security detail. They can, however, request security if there are safety concerns. Members of Congress, including Giffords, saw heightened threats during the health care debate. Giffords' district office in Arizona was vandalized. Former Democratic Rep. John Boccieri of Ohio also received threats, including one from a man who went to trial for threatening to burn down the lawmaker's home. Boccieri praised the Capitol Police but told CNN on Saturday that some public events "could use a degree of more security." "I don't know there's anything that could have been done more in terms of the type of security that could be provided in instances where we're out in front of the public and being accessible. My hope is that we're better than this as a country," he said. Rep. Chellie Pingree, D-Maine, one of Giffords' Democratic colleagues, told CNN she fears Saturday's shooting will "have a chilling effect" on members of Congress. "Sometimes there are people who come before you who are angry. We take it as part of our job," Pingree said. "We never travel with security. It's our goal to be out amongst people, but this is a horrible reminder that there are those people in our society who would choose to do things to undo that." "We are all subject to occasional threats, to angry letters, phone calls. And honestly this does give you pause for the security of our staff, our own families," she added. Rep. Brad Sherman, a Democrat from California, said in The Wall Street Journal, "I hate to put this in the newspaper, but we don't have any security. ... The word 'balance' implies your life is a compromise between constituents and security. For most of my colleagues, there isn't any balance; you just get out there." California Democratic Rep. Maxine Waters told Politico, "We're vulnerable, and there's no real way to protect us." Republican Rep. Jason Chaffetz of Utah and Democratic Rep. Heath Shuler of North Carolina both told Politico they planned to carry guns while in their home districts. Assistant House Minority Leader James Clyburn of South Carolina told "Fox News Sunday" that lawmakers need to look at beefing up funding for security instead of cutting it. Providing security to protect all 535 representatives and senators would be a daunting task, especially considering it would take more than one guard per person. "You can't do anything. You know, the very nature of being a public official is one where you need to press the flesh. You've seen it at the White House with the president. You have to get out and touch people," William Pickle, former U.S. Senate sergeant-at-arms, said Sunday on CNN's "State of the Union." Republican Rep. Jeff Flake of Arizona said while all threats are taken seriously, getting them is just part of the job. "But the danger is, some of these people you dismiss as crackpots, you know, a crackpot with a gun is dangerous, and that -- that is worrisome. And I think what really hit home to all of us on Capitol Hill yesterday was that you're not only putting yourself in danger if you ignore these kind of threats; you're putting staff in danger, as well," he said on ABC's "This Week." Bill Livingood, the House sergeant-at-arms, held a conference call to discuss the shooting with lawmakers, their spouses and staff on Sunday. Livingood said in an e-mail Saturday that the Capitol Police are involved in the investigation, and there is no indication that the incident is a part of a larger threat against Congress. He urged lawmakers and staff to immediately report any suspicious circumstances to their local law enforcement agency and the Capitol Police Threat Assessment unit. "We will continue to review our security posture and make adjustments as necessary," he said. The U.S. Capitol Police on Saturday also sent a message to all House staff advising them to "take reasonable and prudent precautions regarding their personal security." Tom Fuentes, former assistant director of the FBI, told CNN the statement "means nothing." "What is reasonable? Call the police and say, 'I'm going to be holding a rally in a parking lot could you put a couple police officers out there to watch me?' I've been telling members of Congress to hire their own private security at their own expense when they appear in public," Fuentes said. While many lawmakers are on edge, Republican Sen. Lamar Alexander of Tennessee indicated he had no plans to change his schedule. "I'm going to be at the basketball game on the front row, I'll be at the grocery store in a few minutes," Alexander told CNN on Sunday. "We'll be out just like elected officials are supposed to be."